Get a free online team store and start making money today. There is absolutely no catch and as a custom t shirt screen printing business that has been in business for over 20 years in St. Louis, this is simply a new tool we offer our growing clientele. Other than a little time in the beginning to pick out the apparel and logos you want to offer, the only other thing you have to do is collec the profits. We have been supplying team stores and spirit stores both to physical stores and online stores since we began in 1993. Now we simply have the means do to the same online stores but offer them to our customers completely free. Let’s say you run a youth baseball organization called St Louis Pirates. You have parents interested in buying Pirates team gear so they can show their support from the stands. You already have team gear for the players, that’s easy enough to build into the league costs when they sign up. Now you see the opportunity to get more parents becoming walking billboards for your organization who are more than willing to buy some t-shirts and sweatshirts to support their children. Tradionally this was done with an order form which are very time consuming or an online store that costs money for web and hosting fees. 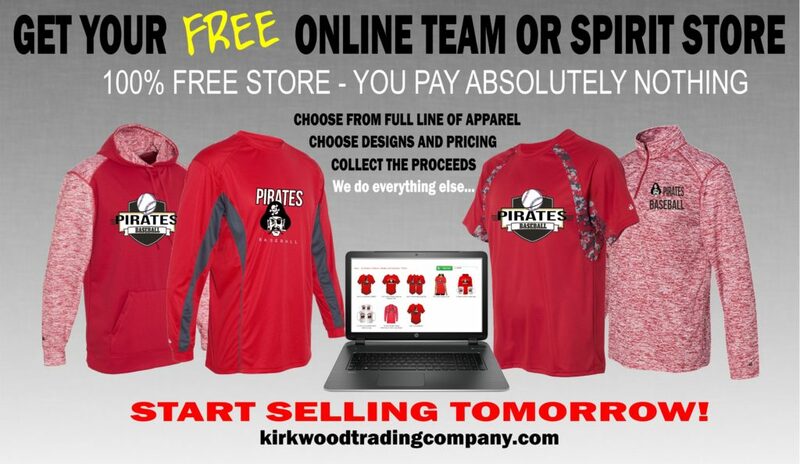 Kirkwood Trading Company offers our clients a great modern free online team store where we do all the work. In just a few short steps we have your free online team store up and running and order coming in. 1. We spend a little time with you to figure out what apparel and logos you want to offer. We offer a full line of apparel from most major manufacturers. 2. We discuss the pricing you want to offer. We provide you with a per piece cost on what we charge to provide the printed or sewn apparel. 3. We start putting your free online team store together. 4. We handle all order processing. We can handle shipping if need be or we can organize the orders by individually bagging the orders for pick up. 5. You collect the profits. We see which option works best for you whether the store remainds open year round, season round, or for just a two week period a few times per year. NOTE: Our costs are less on stores that have a definite beginning and end date to where we can print everything at one time as to opposed a few pieces each week. As we have begun to build our clientele through these free web stores the feedback has been tremendous. Our customers are realizing that an online presence has increased their revenue, eliminated costly inventory, and the best part is it doesn’t involve any of their time. Other than the initial setup where we discuss with you the shirts and apparel you want to offer, we do all the work on a daily basis. Again these free online team stores don’t cost anything. We make our money on the apparel we print and sell in your stores as the screen printer. Do to the volume of stores we currently run we are charged so minimally that there is no reason to those them onto you. We have running online spirit and team stores down to a science. You benefit from the smoothness with which we expedite the transactions and orders. We also provide free online spirit stores as well as free fundraising stores too.